When e-cigarettes were first developed and marketed to the public, there were no real regulations in place. As with most brand new technologies, the cigs were relatively bulky, and they had some issues. Many had batteries that couldn’t be recharged, which made it difficult for people to prepare. The e-liquids that were developed in the very beginning weren’t the best, either. The flavors weren’t as refined as they are today. Now that the vaping industry has grown significantly, there have been more and more studies conducted on the benefits and drawbacks of the eliquids that make vaping possible. Back when vaping was a relatively new concept, the ingredients found in the liquids varied significantly from manufacturer to manufacturer, and it was difficult to know what was safe and what was not. Although there is no evidence to suggest that vaping is 100% safe, manufacturers of liquids are getting smarter about their ingredients. If you’ve ever thought about opening a franchise, there’s probably one thing that’s stopped you outside of the initial financial investment – and that’s the competition. Opening a fast food restaurant franchise is often hit-or-miss, especially since there are so many options from which to choose. Conversely, a vaping lounge has no competition in most cities. While bars and taverns certainly exist, these often allow smoking with proper documentation, and those that don’t allow smoking rarely allow for vaping. 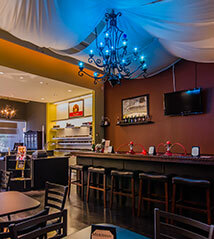 An ecig lounge caters directly to vapers, which makes it unique. Chances are good that your business will thrive, no matter where you live. Finally, the ecig business is thriving economically, too. As more and more people turn to vaping as a safer alternative to smoking, the demand for products continues to rise. Manufacturers are rising to the challenge, too, by producing better, safer equipment and better tasting vapors in hundreds of flavors. By opening a vape lounge, you can get your foot in the door while the industry is relatively young and establish your name long before your competitors enter the market. An ecig lounge caters to a growing group of people who, up until now, had no place to truly call their own. These lounges offer not only a place to enjoy vaping, but also a place to shop for high-quality products at outstanding prices, a place to socialize with friends, and even a place to unwind with a drink at the end of a long day.